What a lovely day, indeed! Down here in San Diego, where Comic-Con kicks off tonight, it is a very lovely blue sky day. Warner Bros is unleashing artwork for the three big movies they're promoting here at the Con. 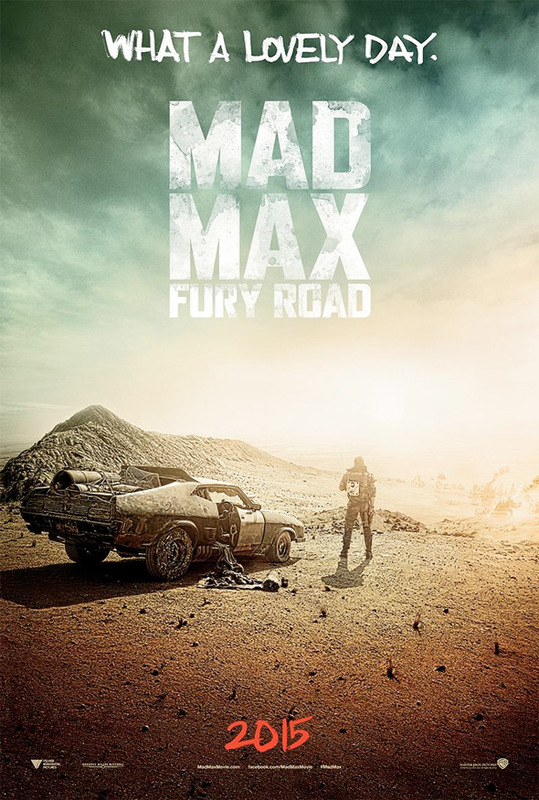 Earlier we ran the first poster for The Hobbit: The Battle of the Five Armies, now we have the teaser poster for George Miller's Mad Max: Fury Road. This movie has been delayed for so many years, with filming taking place down in Australia back in 2012. Tom Hardy stars in this along with Charlize Theron, Rosie Huntington-Whiteley, Nicholas Hoult and Zoë Kravitz. This is just a teaser poster, and we expect a trailer this week too, so it's nothing epic but does look cool. Check out this first look and hold out for more. Here's the Comic-Con poster for George Miller's Mad Max: Fury Road, with Tom Hardy as the new "Max". Soon. WB's panel is on Saturday morning, expect it online then. I hate the waiting...I kinda hoped it would combine the first mad max with Road Warrior, but I trust Miller...eagerly awaiting the trailer. That doesn't look like a V-8 Interceptor. Maybe its the angle, the front quarter panel seems off. If I am wrong I will be happy, if I am right, I really wont care too much, just happy to see Max on the Road again. the original was a classic but I think hardy is a great choice to play the lead. But I am still not convinced, we will see! SWEET! Tom Hardy will kill it. KILL IT! Hot damn I'm excited for this! Fingers definitely crossed for this one being good.